Last night we left Ukraine where we heard stories and met families and seniors displaced from their homes due to conflict and war. We met teens who were discovering their Judaism through programs that Federation funds. Many of the teens now enjoying Jewish youth programs and summer camps did not even know they were Jewish until late childhood or adolescence. We met teens and young adults preparing to make Aliyah to Israel where they will be immersed in Jewish life and be free and safe to be Jews. Today, we made our journey to Israel. After enjoying one of my favorite things (an Israeli breakfast buffet), we visited the city of Ramla. It’s one of the most diverse cities in Israel where Jews from the FSU, Ethiopia and South America live alongside Arabs and Christians. This city is where many new immigrants, like the teens we met in Ukraine, come to restart. 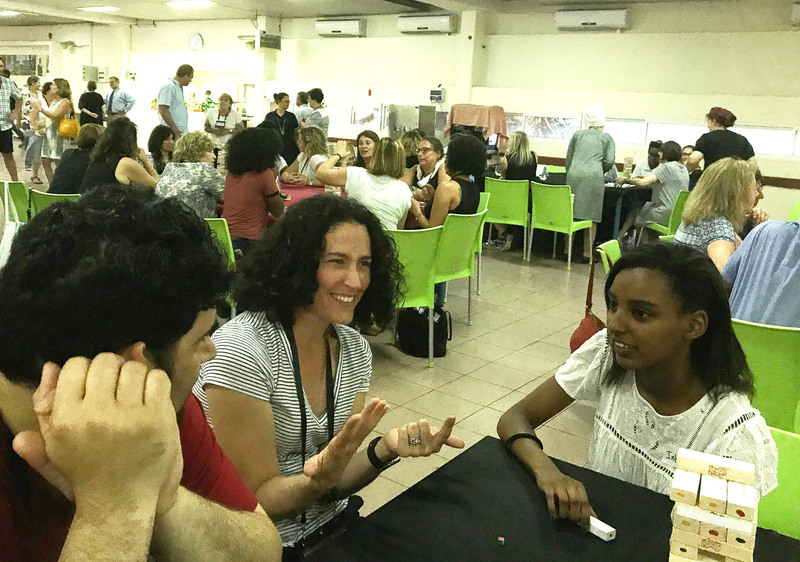 In Ramla, we learned of programs that help new immigrants integrate into Israel socioeconomically. These incredible programs help individuals with visible and invisible disabilities find new skills and jobs, immerse immigrants with few financial resources into a new society, and support Ethiopian teens overcoming barriers to doing well in school. Ultimately, these programs ensure successful integration for the new arrivals. Today we met Dennis, a recent immigrant from Ukraine. Only 8 months ago, Dennis left his home and family in Odessa, a war-torn area, to make Aliyah. Dennis is settling in to pave the way for his family to follow him – his wife, young child, and child-on-the-way. His successful transition would not have been possible without the help of the Professions for Life program, a joint effort between the JDC, local municipalities/companies like Taavura, and the Israeli government. It’s not enough to help bring Jews out of dire situations to Israel; they need to learn the culture and language, and find jobs and places to live – all necessary to thrive in their new home. Luckily, her community had the Ethiopian National Project (ENP) SPACE program. Suggested by her school teacher, the program provided her with individual attention to help improve and ultimately excel socially and academically. She now hopes to attend the Technion University in Haifa to study software engineering after she serves in the IDF. This would not have been possible without the ENP SPACE program. Sitting next to her at dinner and seeing her smiling face, it was easy to tell how grateful she was for the opportunities the program provided. I was blown away by the ability of these programs to truly transform the lives of each of the individuals we met, along with so many others. The funding our Federation provides to overseas programs through the JDC truly helps Israel thrive. They don’t give just ”give a man a fish,” but rather ”teach him to fish!"